It’s time for another installment in our Required Reading List—this time for a book that is brand new to our world and bound to make a lasting impact on how Christians discuss grief, death, tragedy, and life in the middle of it. Almost immediately upon its release, this book made the New York Times Bestseller List, and sold out on Amazon in just 3 days! Here you’ll find a full review, links to grab your own copy from Amazon (it's back in stock! ), and a free printable at the end! Kate is a professor at Duke Divinity School and an expert in American religion, specifically having spent years surveying the American prosperity gospel movement. She is married to her high school sweetheart Toban and together they have a son named Zach. Things were going pretty peachy until Kate was diagnosed at age 35 with Stage IV cancer. This book takes a look at Kate’s experience with the prosperity gospel, where God supposedly grants us health, wealth, and happiness in exchange for our faithfulness AND what it feels like when your life “isn’t very #blessed”. Kate is wise, funny, and honest as she navigates these challenging waters. This book is a gift to us and will prove practical for all of our lives. We know that at some point, we will face grief and hardship and unexplainable tragedy and not knowing what to say. Kate offers us a detailed look into her world and a lifeline for these moments. Honestly, the book is unlike anything I’ve ever read before. I participated in the book’s launch team called, “Team Kate”, but I find that I will continue to live my life on “Team Kate”, savoring the incredible gifts she has given us already, and praying for more—more hugs, more silly presents, more French toast in the morning, more humor, and more of her wisdom. I am better having read this book. Grief and life and death and ordinary time in the midst of it all now have been illuminated like no one else has done before. Kate, you are a beautiful person, and I am forever cheering you on. If I have to pick one, I was probably the most in awe reading this chapter. Kate has created something so beautiful in these pages of discussing how to live in the right-now, ordinary time, fully present. Her authenticity and toughness and heartbreak and humor somehow combine on the page in ways that have captivated me and will not let go. I don’t want them to. If I can grasp her words and live them, I would be inching closer to a life of abundance that makes no sense while making all the sense in the world. Her appendix includes two parts: “Absolutely Never Say This To People Experiencing Terrible Times: A Short List” and “Give This a Go, See How It Works: A Short List”. Both are incredible, wise, funny, and practical. Our world needed this. Kate delivered. Download this printable quote from the book at the bottom of this post! Kate has written a book previously on the American prosperity movement called Blessed. You can find it here*. 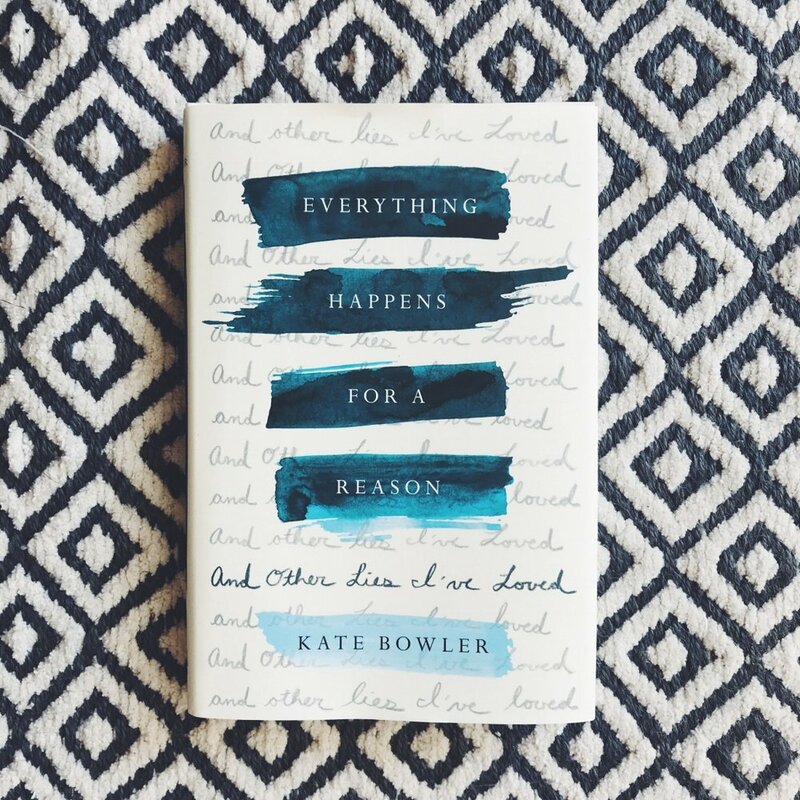 This month, Kate launched her podcast Everything Happens, which you can subscribe to via iTunes and all the other places you play podcasts (Forgive me, Androids—I do not know them by name). Follow her on Instagram and Twitter @katecbowler. Grab your own copy of Everything Happens for a Reason and Other Lies I've Loved HERE*! Share your excitement by downloading this free 4 x 6 print to display on your desk! Click here to download the print!